Woerner gives you a contemporary and elegant design with the 520 Series Sanctuary Collection, making these pieces the perfect addition to any sanctuary or chapel. Each piece is constructed of selected flat-cut red oak veneer plywood and solid hardwood red oak lumber. You have 16 standard stains to choose from. Then the product is finished with Enduracote III, a specially formulated catalyzed lacquer that resists water and other stains. 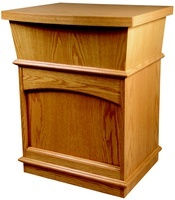 The collection includes a Lectern, Altars, Celebrant Chairs and a Credence Table.